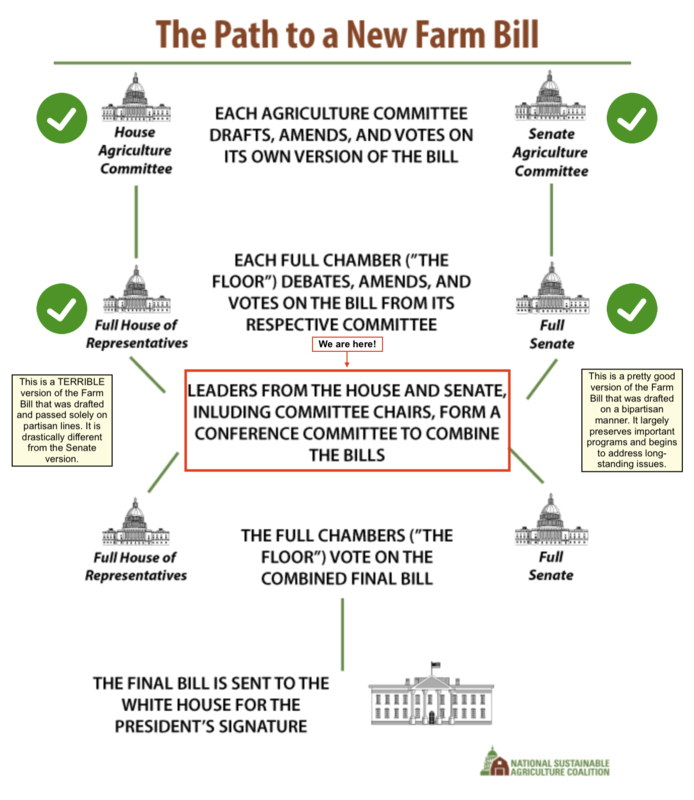 Thank you to our friends at NSAC and Slow Food USA’s Policy Committee for this graphic of how the Farm Bill moves to passing below. As of Aug, 2018, the Farm Bill is in conference and the time to talk to our representatives is here. Fondy Food Center signed onto Feeding Wisconsin’s letter asking “Speaker Ryan and Representative Duffy to fight for Wisconsinites in the upcoming Farm Bill negotiations and to commit to passing a strong, bipartisan Farm Bill that strengthens rural communities and fights hunger by keeping SNAP strong and effective.” Will you join us? Join us in telling our legislators that we want a Farm Bill that supports healthy food, prospering farmers, sustainable agriculture and thriving communities. Looking for talking points? See below for our Executive Director’s Letter to Representative Moore.If you do not know how to contact your representative, you can find out here. Nutrition – The nutrition provisions of this H.R.2 would, if enacted, increase food insecurity and hardship for the one in eight of our fellow Americans who rely on the Supplemental Nutrition Assistance Program (SNAP, formerly known as food stamps). Given the great wealth and prowess of this nation, Congress should be ashamed to let any Americans go hungry, let alone strip the right to food access from roughly 1 million low-income households (with about 2 million persons total). Many of the Chairman’s stated themes for the nutrition package — funding job training, modernizing benefit delivery, strengthening program integrity, and supporting healthy eating — are priorities that Committee members share and should have been essential components of meaningful bipartisan bill that would support Americans’ right to ample, healthful food. Unfortunately, this fully partisan proposed bill includes provisions that are unworkable, untested, and costly and that will strip food assistance from millions of in-need Americans. To protect low-income American families, and the American farmers who source to and benefit from food assistance programs, we urge you to strip the current cuts and devastating changes to SNAP in this bill, and instead work in a bipartisan fashion to deliver policy proposals that will help end hunger and malnutrition in America – not exacerbate them. Local food – Local and regional food markets represent a vital economic opportunity for farmers in every state across the nation. Not only do they improve farmers’ bottom lines, they also increase American families’ access to fresh, healthy foods! We are shocked that, given the overwhelmingly positive economic and health impacts of local/regional foods, that this bill would eliminate all funding for three of the most vital programs supporting this growing industry: the Farmers Market and Local Food Promotion Program, the Value-Added Producer Grant Program, and the National Organic Cost Share Program, smaller organic farms may not have the support they need to afford to be certified organic. To put us on track towards good, clean, and fair food for all, Congress must RESTORE FUNDING for these critical local food programs. In addition, we urge Congress to incorporate components of the Local FARMS Act (H.R. 3941) into the bill. Conservation – We are dismayed that this bill erases support for resource stewardship on 70 million acres of working farm and ranchland by eliminating the Conservation Stewardship Program. This voluntary program is overwhelmingly popular with farmers and its ability to improve the health of the land’s soil, water, and profitability has been proven time and again. To help farmers protect natural resources and farm sustainably, the House must reverse the elimination of CSP. In addition, we urge Congress to incorporate components of the SOIL Stewardship Act (H.R. 5188) into the bill as it moves through the House. Beginning and socially disadvantaged farmers – This bill misses an opportunity to invest in beginning farmers, military veteran farmers, and farmers of color at a time when our existing farmer population is rapidly aging out of the industry. While we are pleased that the bill maintains funding for the Outreach and Assistance for Socially Disadvantaged and Veteran Farmers and Ranchers Program (Section 2501), we are gravely disappointed that it does not restore funding to historic levels or make needed improvements. Neither does the bill include funding for the farm bill’s primary program for beginning farmer training – the Beginning Farmer and Rancher Development Program. Finally, the bill neglects to make critical improvements to loan and conservation programs specific to beginning and socially disadvantaged farmers’ needs. The status quo is not enough – now more than ever is the time to invest in the success of these farmers. We urge you to incorporate components of the Beginning Farmer and Rancher Opportunity Act (H.R. 4316). Crop insurance and commodities – Crop insurance and commodity subsidy programs make up some of the costliest parts of the farm bill, yet they include shockingly limited mechanisms for evaluation and very little in the way of means-testing. We know the importance of keeping the farm safety net strong, and this bill could have achieved this by modernizing our crop insurance and subsidy programs so that they equitably serve all farms – regardless of their size, geography, or crop type. The bill also creates more loopholes in subsidy payments that will cause further distortions in land prices and create an unfair playing field for farmers. Congress must modernize crop insurance for diversified and next generation farmers and address the role unlimited subsidies play in limiting opportunity for others. We urge you to incorporate components of the Crop Insurance Modernization Act (H.R. 4865) in the farm bill. Research – Seeds are the building blocks of agriculture, and our nation’s seed breeding and public research programs are in crisis. We are dismayed that this bill does not prioritize public seed development that provides farmers with diverse, regionally adapted, pest- and disease-resistant seeds. The time is now to prioritize critical seed breeding research – Congress must do its part to ensure researchers and the farmers who depend on them can develop the seeds we need to keep ample food in our future. We urge you to incorporate components of the Seeds for the Future Act (H.R. 5208) in the farm bill. Join us in protecting SNAP federal nutrition benefits! The USDA is requesting public comments on proposed rules that would result in cuts to SNAP for jobless people and their families. Sign on to our letter below to tell the USDA that food is a right, not a privilege. Join the Milwaukee Farmers Market Coalition Policy Group, as an individual or as a representative of your organization, farm, or business, so our collective voice can be heard. Re: Comments on the Proposed Rule; Supplemental Nutrition Assistance Program: Requirements and Services for Able-Bodied Adults Without Dependents; Submitted online via regulations.gov. I am writing on behalf of Fondy Food Center and the Milwaukee Farmers Market Coalition’s Policy Committee to provide comments on the proposed rulemaking for SNAP requirements and services for able-bodied adults without dependents. The Fondy Food Center (FFC) is a non-profit that brings healthy food and economic opportunity to Greater Milwaukee through its farmers markets, farm project, and healthy food access initiatives. FFC is a nationally recognized leader in farmers market SNAP redemption and nutrition incentive programs. The Milwaukee Farmers Market Coalition (MFMC) works to connect more low-income consumers with the public health and economic benefits of farmers markets. The MFMC Policy Committee seeks to advocate for policies that support that aim. 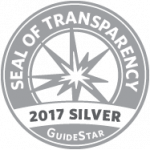 Our comments reflect our commitment to improving the local economy through increasing access to healthy, local food. We appreciate your consideration of our comments below, and we look forward to continue engagement as the FNS considers making changes to the most important anti-hunger program in our country. SNAP improves nutrition, health outcomes, and reduces healthcare costs, while improving the local economy. Research shows that that SNAP is vital to a variety of our nation’s priorities by its ability to reduce food insecurity and poverty, support economic stability, and reduce healthcare costs. Cutting SNAP hurts businesses and people. At Fondy Food Center we see the benefits of SNAP on a weekly basis at our farmers markets – for both our low-income community members and farmers. Through our SNAP redemption and nutrition incentive programs – which help thousands of struggling families put healthy food on their tables by making locally grown food more affordable – we’re impacting public health and the local economy. Food is a human right, not a privilege for only those with work. The notion that one’s work status should determine whether they, or their children and dependents, should have access to food, is diametrically opposed to our assertion that food is a right, not a privilege. The USDA has asked for information that would better support the Department’s goals. It is our recommendation that congress should reverse the SNAP time limit law. In the meantime, the Department should not limit a state agency’s right to request to waive the ABAWD time limit. In fact the Department should do everything in its power to strengthen and expand SNAP – this would better serve the USDA’s strategic goals. We wholeheartedly support the mission of the FNS, “to increase food security and reduce hunger by providing children and low-income people access to food, a healthful diet and nutrition education in a way that supports American agriculture and inspires public confidence.” We also commend the Department for stating the following: “No American should have to go hungry.” We believe that includes people without work, and their children. Workforce training does not have a successful track record. Taking away state’s rights to waive the ABAWD time limit will lead to increased hunger, poorer health outcomes, and more costly health care, and will not lead to significant rates of employment. Since 2015—when Wisconsin’s waiver expired and FoodShare Employment Training (FSET) was implemented—hunger and reliance on emergency food pantries have increased, tens of thousands of people have lost their SNAP benefits and only 12% of people who have gone through FSET have gotten jobs. Sign on as a representative of an organization, farm, business, etc. Yes I'd like to be considered a member of the MFMC Policy Committee! I am unable to join at this time.